So my eldest brother, Andrew, had been nagging me to make him a batch of brownies for months and months. A couple of months ago, I gave in to his nagging and made blondies (white chocolate brownies). However, we were all quite disappointed. The blondies tasted great but just didn’t taste or feel like brownies and were more like a sponge cake. There was no lovely gooeyness to them that we were all expecting. Now I don’t know why, and I don’t know whether blondies are suppose to be gooey or not. There was a brownie hole still in my heart. As our brownie cravings were not satisfied, I decided to make some triple chocolate brownies this weekend. Brownies are rather simple to make, but the timing in the oven is very important (just like any cake really!). You don’t want to overcook brownies as you want the yummy gooey part. 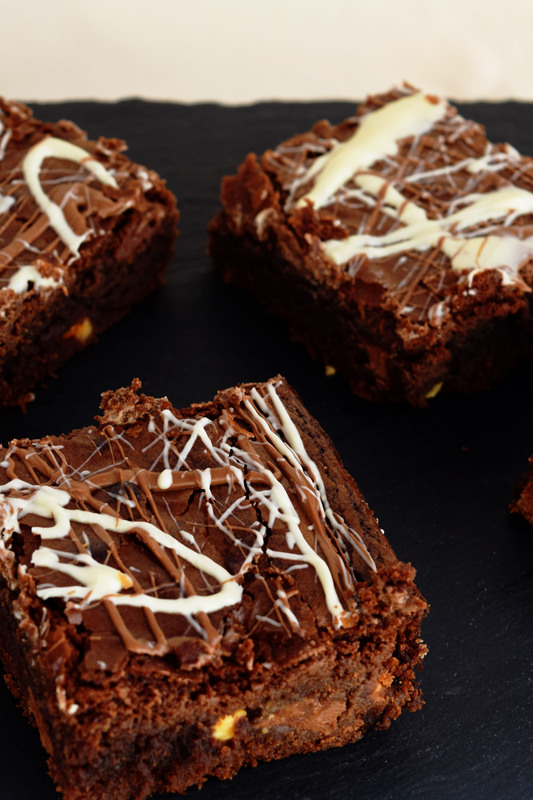 So here is my favourite recipe to make chocolate brownies with very simple instructions. Line a tin with greaseproof/baking paper. Preheat the oven to 160C. Break the plain chocolate and place in a large glass bowl with the butter. Place the bowl over a pan of simmering water and allow to melt. Combine the flour and baking powder in a bowl and set aside. Once the chocolate and butter has melted, remove the bowl from the heat and stir in the caster sugar. Add the beaten eggs and vanilla essence and mix. Fold the flour into the mixture and add the chocolate chunks. Pour the mixture into the cake tin. Place in the oven and bake for 25-30minutes. The top should be firm and the inside should feel soft (the gooeyness stored inside :), YUM!). Allow to cool in the tin. Once cooled, remove from the tin and cut into squares for everyone to enjoy! We enjoyed the delicious brownies with a bit of (mouth watering and Fairtrade) Ben and Jerry’s ice-cream. Here with a scoop of Baked Alaska ice-cream. Previous Post Giant Chocolatey Cupcakeness! !